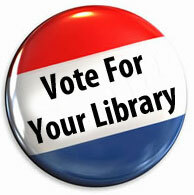 The Chemung County Library District budget vote will be held on Tuesday, November 8th. The proposed 2012 tax levy of $2,528,243 reflects a 1.9 percent increase in the annual library tax levy. The library vote is held in conjunction with the general election. Anyone registered to vote in the general election in Chemung County is eligible to vote on the library budget and trustee candidates. The Library District is experiencing a period of unprecedented opportunities. The most recent statistical report shows that 567,763 items were checked out last year, with an average of 27,000 patron visits each month. The collection includes 281,000 books, 15,074 videos, and 9,682 audio items. The district’s computers are used by over 225 people, on average, each day. The district has continued with new digital initiatives including the use of social media, early literacy station computers, and downloadable eBooks and audiobooks for adults and children. The public is invited to a budget presentation on Monday, November 7th at the Horseheads branch at 6pm. More details about the 2012 library budget are available on the library’s website. This entry was posted in District News, Uncategorized and tagged budget, vote by ccld. Bookmark the permalink.